Manchester United’s Champions League run came to a juddering halt in the Camp Nou, where a 3-0 defeat gave Barcelona a comfortable passage into the semi finals for the first time in four seasons. Ole Gunnar Solskjaer’s side travelled to Barcelona with a 1-0 deficit to overturn from the first leg, and in a breathless first 10 minutes had two good chances to level the tie. Neither Marcus Rashford nor Scott McTominay were able to find the net, though, and the hosts took control when Lionel Messi took advantage of errors by Ashley Young and David de Gea to fire two goals in quick succession after the quarter-hour mark. United huffed and puffed but never came close to blowing the Barca house down, and the tie was finally ended when Philippe Coutinho blasted a trademark effort into the top corner just past the hour. United must now focus on finishing in the top four in the Premier League, while Barca continue their quest for a sixth European Cup. 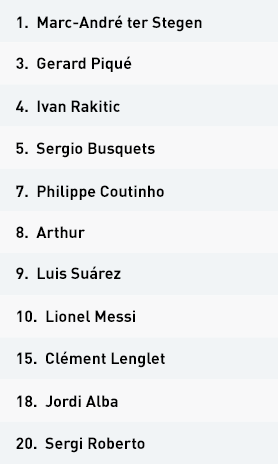 Despite beginning in their traditional 4-3-3 structure, Barcelona dropped Sergio Busquets very deep, in between centre-backs Gerard Pique and Clement Lenglet, with left-back Jordi Alba moving high and wide. Central midfielders Arthur and Ivan Rakitic also dropped deep, hoping to draw their markers towards them, in what resembled more of a 4-2-4 shape focused heavily on building down the left. The front trio of Philippe Coutinho, Luis Suarez and Lionel Messi pinned the entire Manchester United defence back, with Messi occupying the spaces between Ashley Young and Fred. This meant the Brazilian, operating as United’s deepest midfielder, couldn’t step forward as an extra presser, giving Barcelona a deeper overload. From here, they were able to play around United’s higher block, with Alba in particular surging forward on the left. It was from their right that the hosts took the lead, however, when Messi pounced on Ashley Young’s loss of possession and nutmegged Fred before bending a superb low shot into the far corner. The Barca captain doubled the lead within five minutes, although David de Gea should have stopped another low shot from distance. In total control of the tie, Barcelona continued to split and bounce their way out of United pressure – the major difference between the two sides in possession. They continued to penetrate via Alba from the left in the second half, with Coutinho’s occupancy of right-back Victor Lindelof creating extra space for his left-back to receive behind the visitors’ midfield. The front trio continued to stretch United’s back line, with splitting passes setting both Suarez and Messi in behind. As United continued to defend in a 4-5-1, Barcelona’s back line had more time on the ball to repeatedly pick forward passes into Alba between the lines. The tempo naturally slowed as Barca controlled the game, but Coutinho’s wonderful strike from distance confirmed the win just past the hour. Out of possession, Barcelona’s three-man central midfield initially struggled to cover the width of the pitch. This allowed the visitors to twice penetrate through midfield and then in behind the home back line, especially as United’s central midfielders were making surging runs ahead of the ball to join the front three. Once Barca established control, the visitors threatened much less. However, as the hosts pushed Alba higher, spaces continued to be available for Marcus Rashford in particular to transition forward. 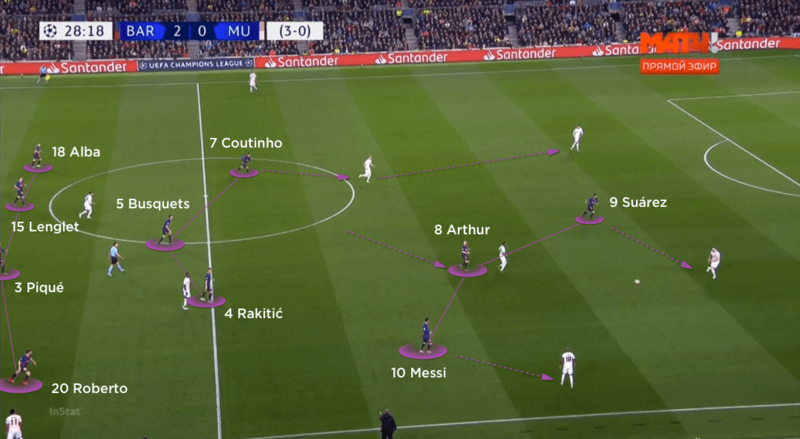 Arthur’s willingness to cover both Coutinho and Alba was a key factor in the delaying of United’s counter-attacks; this eventually allowed Lenglet to slide across as a makeshift left-back, with Pique and Busquets supporting in behind. 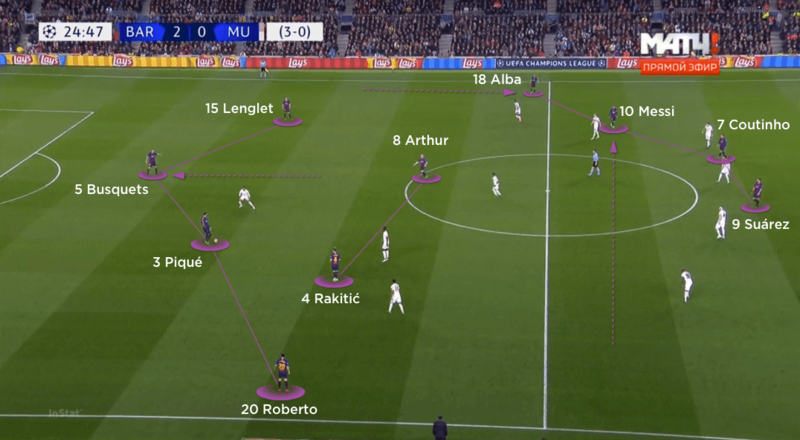 Messi’s inside movements from the right usually allows Sergi Roberto to overlap from right-back, but it was obvious that the home side were wary of United’s counter-attacking threat. 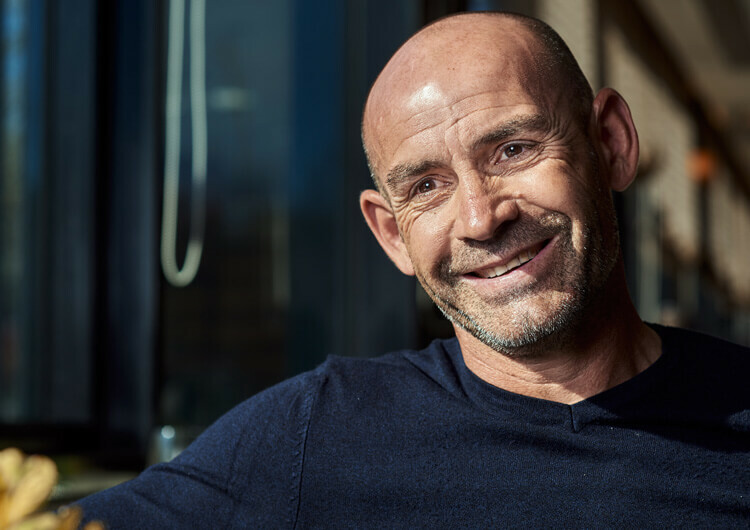 Roberto’s deeper positioning during the hosts’ build allowed Barcelona to quickly drop into a back four while also blocking off any switch of play from Rashford into Anthony Martial or Paul Pogba on the United left. The visitors were thus unable to counter using the full width of the pitch. The Barca press reduced in the second period, as they formed a 4-4-2 mid-block. This gave United’s central midfielders more space and time on the ball, but always in front of the Barcelona midfield. The hosts remained compact between the lines; Rashford continued to look in behind, but Marc-Andre ter Stegen comfortably swept up any direct aerial passes as Barcelona eased into the last four. Barcelona set up in their usual 4-3-3 formation, but Sergio Busquets often dropped into the back line while Jordi Alba pushed high and wide from left-back. This helped create a 4-2-4 structure in possession, with the double pivot of Arthur and Ivan Rakitic creating extra spaces between the lines. Without the ball, the hosts pressed aggressively in a 4-3-3 structure. Their desire and speed ensured the Manchester United player in possession was always under pressure. Coutinho’s occupancy of United right-back Victor Lindelof gave Alba extra space to receive aerial passes. United’s 4-5-1 defensive shape allowed Barca’s back line extra time in possession to find longer passes forward. United nominally set up in a 4-3-3 shape, but Jesse Lingard dropped deeper from the middle of the front three to form a midfield diamond. Split strikers Anthony Martial and Marcus Rashford looked to penetrate in between Barcelona’s full-backs and centre-backs. After starting in a higher 4-3-3, United reverted into a 4-5-1 mid-block out of possession. This restricted Barca’s opportunities to penetrate, but having more players behind the ball limited the visitors’ ability to transition into attack. 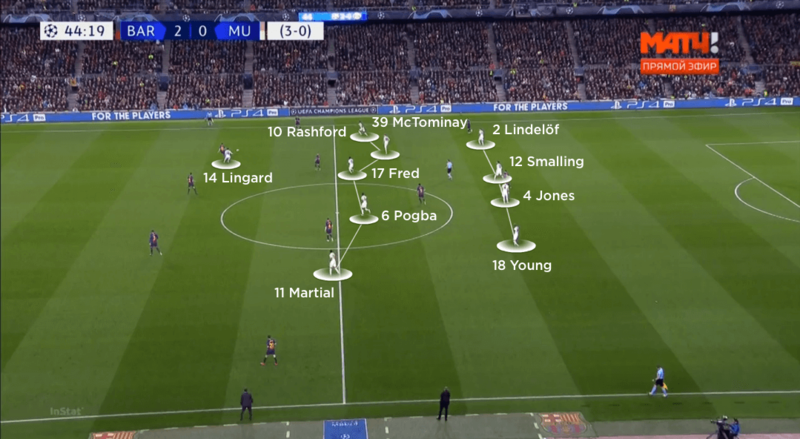 Barcelona’s deeper 4-4-2 block in the second half afforded the likes of Fred and Paul Pogba more time and space to play more direct passes in behind for Rashford. Ole Gunnar Solskjaer initially set Manchester United up in a 4-3-3 formation, with Marcus Rashford’s direct running in behind Barcelona’s back line nearly resulting in an away goal within the first 30 seconds. Moments later, Scott McTominay failed to control the ball when through on goal, with United’s forward running off the ball giving their back line more passing options. 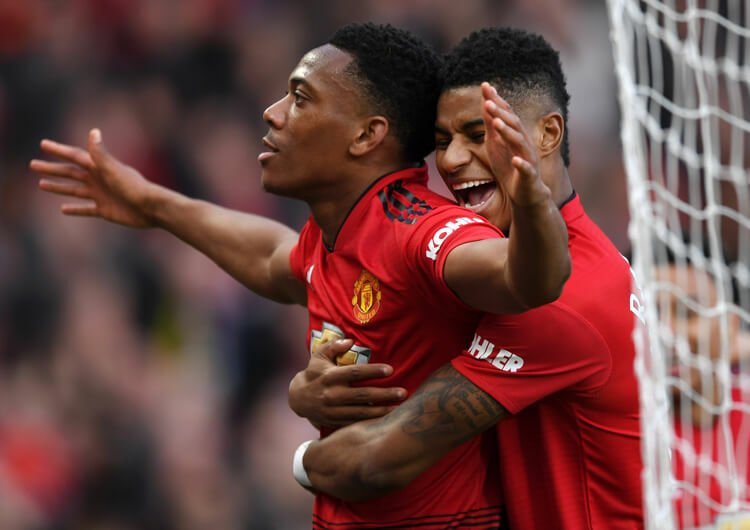 Once Barcelona gained control of the ball – and thus the match – United’s play was solely focused on the regain, aiming for quick transitions via the pace of Rashford and Anthony Martial. They tried to attack the space in behind Jordi Alba, but Barcelona’s quick recoveries and experienced back line slid across to close any spaces down. Right-back Sergi Roberto’s deeper positioning during Barcelona’s build limited Martial’s opportunites on the counter. Whenever United did manage to secure any sustained possession in the first half, Jesse Lingard dropped to become a central number 10 in a diamond 4-4-2 formation with split strikers looking for space between the Barca centre-backs and full-backs. They struggled to get past the hosts’ pressing forwards and midfield unit, however, as their build-up became more and more disconnected. United continued with split strikers in the second half, with Rashford continuing to threaten in behind with more central runs, and Martial staying wide. 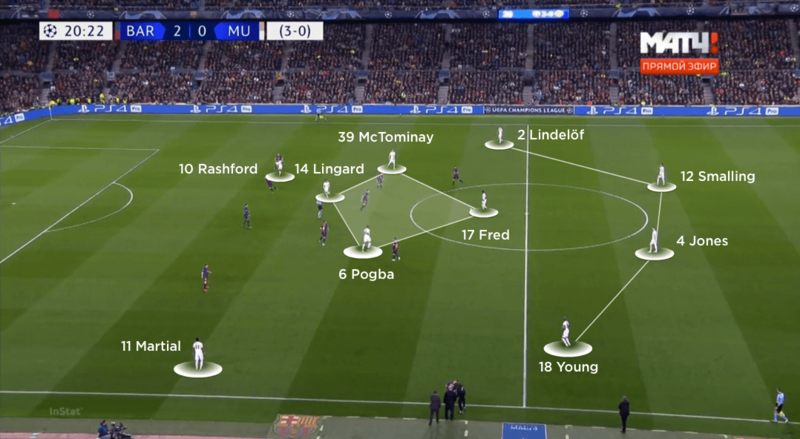 Lingard looked to move away from the centre, to drag Barca’s double pivot away and create more room for Rashford, but the hosts were happy to sit back and allow United’s deeper midfielders more possession. Fred and Pogba looked to play direct passes in behind, but they rarely connected with a frustrated Rashford as United’s Champions League run trailed to a disappointing conclusion. Out of possession, the visitors pressed high in a 4-3-3 structure, hoping to pinch the ball closer to Barcelona’s goal. They soon discovered that Marc-Andre ter Stegen’s control in possession as the extra man comfortably helped the home side build around or over their first two lines of pressure; United thus converted into a mid-block. As Barcelona gained control of possession, they regularly built through United’s front line. The visitors’ back four protected the width of the penalty area, which meant that Scott McTominay in particular was dragged back by Jordi Alba’s forward runs. 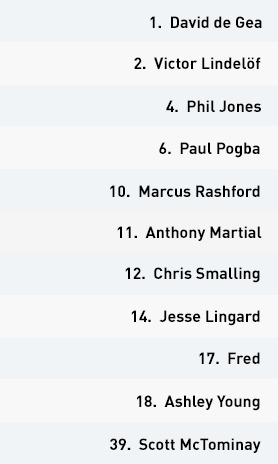 This limited their ability to block passes into central midfield, although the two goals they conceded in quick succession were more to do with individual errors – first Ashley Young and then David de Gea – than structural weakness. United subsequently alternated between a 4-3-3 and a 4-5-1 mid-block – the latter gave more defensive protection, but meant they offered little threat during moments of transition. The 4-5-1 also gave the likes of Gerard Pique and Sergio Busquets more time on the ball to build from the back. From here, Barca easily found splitting passes into their front line, or Alba pushing high from left-back. It was from one such Alba run that the hosts scored their third, as he set Messi’s clipped pass into the path of Coutinho – the former Liverpool attacker’s superb finish was the final nail in United’s Champions League coffin.